Join health and food expert, Andrea Beaman, in this enlightening and educational seminar on Thyroid health. Andrea will share with you the steps she took to successfully heal her own debilitating thyroid disease and how you can too. 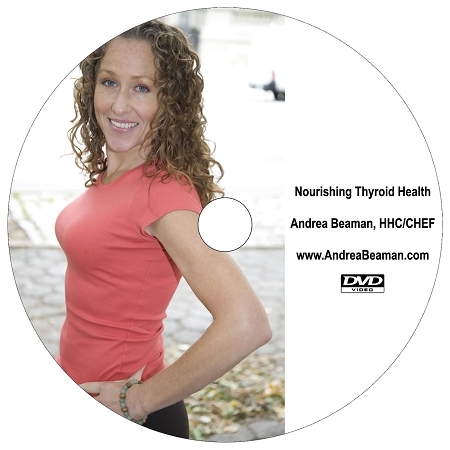 Use this DVD and get started healing your thyroid right away! This product includes a downloadable PDF that is immediately available after your purchase. Once the DVD has been purchased, check your receipt that is emailed to you. In it is a a link at the bottom to download the DVD PDF. Download the PDF as soon as you purchase this product, as the link will expire in 14 days. I have "reviewed" it twice, taking notes to encourage my memory! I'm now trying to get my cupboard stocked with some of your suggested foods, always organic! The DVD was just what I was looking for. Currently I have a client who has been diagnosed with Hashimoto's and is very concerned about her health and does not want to go on any medication. So we are working together to get her in top health with the understanding of what a healthy way of eating really is. and the impact it can and does have on your amazing body. The PDF was a great plus to have, I love the info on what foods are not beneficial to someone with a thyroid condition and how if eaten need to be cooked properly.Your persevering enthusiasm has further encouraged me to know the never ending benefits of a good whole food regimen for eating. You have revitalized my reason for doing this work. Thank you. I loved how Andrea brought the spirit, mind, body connection into the healing process. I especially appreciated the humor and passion she expresses in this DVD. A beautiful example of having within us and resources around us to heal ourself. I'm getting her books so I can learn more on caring for my health. Great information. I love the idea of helping the body to heal itself rather than always jumping to medication first. This DVD on the thyroid is absolutely excellent. It is full of information that is explained in a way that is comprehensive and easy to understand. I love Andrea Beaman's personality. She explains how a healthy lifestyle is obtainable and effective in healing the thyroid naturally, without medication. I love this DVD and would recommend it to anyone interested in thyroid disorders. Andrea's DVD was a fantastic source of information! As both a registered dietitian and a macrobiotic counselor, I am always looking for that great combination of holistic and scientific information. This DVD with its handout were great sources of information, and met that combination of east and west perfectly. I am extremely happy with the DVD. I am a current student at the Institute for Integrative Nutrition and have gained so much knowledge from the DVD and also my recent purchase of The Whole Truth. I am currently working with a client who has thyroid issues and the knowledge I have gained through Andrea's resources has provided me with the knowledge to feel comfortable counseling my clients. This dvd is packed with lots of information. I know I will be watching it over and over. You feel like you are in Andrea's class. It is so nice to hear that I can heal myself.